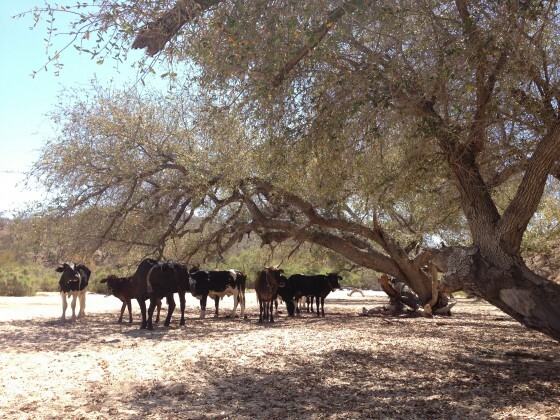 Quercus brandegeei is a species of oak endemic to Mexico, found only in a very small range on the southern tip of the Baja California peninsula. 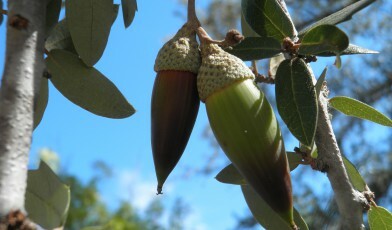 It grows in ephemeral stream beds that fill up after hurricanes and has very distinct, elongate acorns, which are harvested on a small scale to supplement local diets. Based on life cycle estimates for its close relatives, Quercus oleoides and Quercus virginiana, researchers estimate that Quercus brandegeei trees can live up to 800 years. Because it has such a limited distribution, it is listed as Endangered on the IUCN Red List. In addition to its small range, however, there is an additional ecological factor that seriously threatens the survival of this species: lack of regeneration in the wild. Ecologists estimate that no new seedlings have established in at least 100 years, but the reason why this species is not regenerating remains a mystery. Factors that could be at play include drought caused by long-term climate change and seed predation by local cattle ranching. These observations suggests the age structure for Quercus brandegeei is skewed upwards with aging individuals and few or no new, young trees. Researchers have observed some vegetative root sprouts directly connected to the mother trees. Assuming some portion of these sprouts reach maturity, these root sprouts are seemingly the only reproductive strategy for this tree. The Global Trees Campaign, in conjunction with the Morton Arboretum, La Universidad Nacional Autonomo de Mexico and Jardin Botanico de Vallarta are working on a project to research what is preventing regeneration of Quercus brandegeei in order to inform future conservation efforts.